Just as the sun was setting in my part of the world, I received a message from a fellow blogger, Elliot who writes a most interesting and varied blog brain splats, that he’d nominated me for a ‘Sunshine award’. I have a guarded view of awards (expressed before too). It always feels great to be appreciated and it’s important that you show that to people whose efforts you respect and care for. But at the same time, too often in the past – especially in the organizations that I have worked in – have I seen presentations of awards unwarranted, even fatuous. So as long as awards come from people whose opinions matter, people that you respect and for work that’s done well, I’m fine. But that gets very subjective. Hence, my lack of comfort with them. Ironically, I came across brain splats through a post on awards on another blog that I enjoy reading. Since then I’ve regularly read with interest Elliot’s thoughtful and witty posts and have developed a lot of respect for him. I do have enough weight of ego to believe I have a decent blog going (I wouldn’t be at it otherwise) and sufficient humility – I hope – to be deeply appreciative of any plaudits that come my way. I have said this before and I will say it again: I write to share my love of music with whoever cares to drop in on my blog and that people do come by is in itself hugely gratifying. But to have a peer explicitly state his or her appreciation for what I do here is very, very special. Thank you Elliot. 2. Include the award’s logo in a post. 3. Nominate 10-12 other bloggers. 4. Link to the nominees. 5. Link the person who nominated you. – As the name might suggest, I do have a macabre sense of humour. – I love to ride my bicycle. And I hope the increasing cost of fuel will get more people in my country back on the bicycle. – I’m a proud slave to our two cats. – I harbour a deep desire to have 4 dogs and 6 cats. – I have 2 guitars neither of which I play well. – The cats run for cover when I even touch either of the guitars. – I come from a family of musicians on my mother’s side. – I don’t care much for the lossy mp3 format. I find it useful on my iPod but I prefer to listen to CDs and lossless formats. – I often find ‘inspiration’ for my posts listening to music on my iPod (I told you it has its uses) on a quiet afternoon at a local pub under the invigorating influence of a good microbrew. – I can’t go on about myself – it’s getting boring. I don’t follow many blogs but the ones that I do (most of them are about music), I do so regularly and are ones that I’m very fond of and have a lot of respect for. 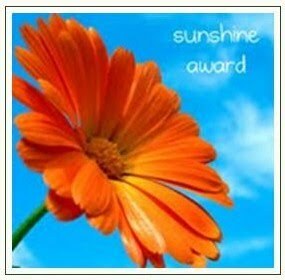 These are my nominees for the ‘Sunshine Award’. And to each of them I say, well done and please keep at it – you spread much joy in a world increasingly short of it. And this award does NOT have any strings attached. gARTSby’s Blog – http://gartsby.wordpress.com/ Gwyn does not post very often which is quite natural since she’s an artist. I love the oils she does. Little By Listen – http://littlebylisten.com/ This is one of the best music blogs that I have read. The trio of Todd, Austin and Wes churn out heaps on music that they love. I Made You a Mixtape – http://sayitwithmusic.wordpress.com/ I have had my ears opened to a lot of music for the first time here. Lily Catherine’s blog – http://lilycatherine.wordpress.com/ This is mostly a photo blog. I enjoy her capture of places. Bob Dylan Wrote Propaganda Songs – http://bobdylanwrotepropagandasongs.wordpress.com/ No, this is not all things Dylan. There’s much, much more. Thoughts From West Five – http://tfw5.com/ Although it’s mostly music, there’s a bit of sport and the odd surprise – and a delightful one at that – as the one titled ‘Picasso and Modern British at the Tate Britain’. Prev Some Turkish Delight, Anyone? I am terrible at trying to play the guitar, and I also prefer cd and lossless formats!